This week is Metallic Madness. I've been trying a few different things with this plate for a while. This week's theme gave me the inspiration for something better! I would say I took some liberties with the madness part of this challenge. I used China Glaze Stone Cold and Pure Ice Platinum. Stone Cold dries matte, but it ended up with a satin finish with a shiny topcoat. 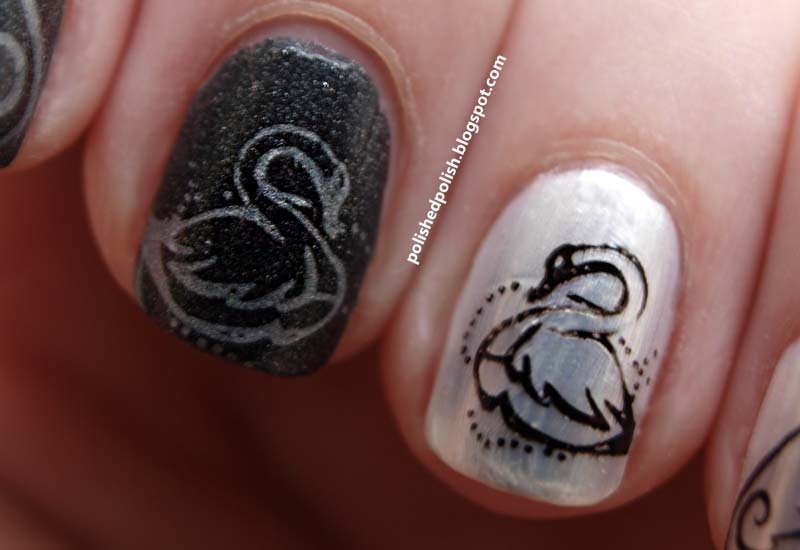 I had to use a different black for the black swan because the stamper couldn't fully pick up Stone Cold. To get the swan facing the opposite direction, I stamped with my XL stamper and then onto my Salon Express stamper before my nail. This is definitely a trial and error method, but it eventually worked out well. I wasn't a fan of the asymmetrical wings on this plate, but it actually turned out better that way for me on this manicure. My pinky nail is way to small for the wing size on the left. 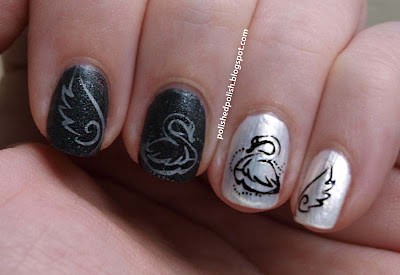 I used the stamper transfer method on my right hand to get the wings on the correct fingers too. I love this design! Very clever and very pretty!